First cut a 5 3/4" x 8 1/2" piece of purple card stock and fold it in half for the base and a 4" x 5 1/2" piece of pink for the front. Next emboss the front with a Darice Easter Egg Background die and set it aside. Then cut out the ovals for the bunny and sentiment with Spellbinders Beaded Ovals and Classic Ovals dies and punch the sentiment's background with a Fiskars scalloped oval punch. Next stamp the image and sentiment with a stamp positioner in Stazon Jet Black ink then color the bunny with an aqua painter and Stampin' Up! So Saffron, Pink Pirouette, and Wisteria Wonder inks. Then attach the bunny to the beaded oval then to the front, attach the sentiment to it's background then to the front and the front to the base. 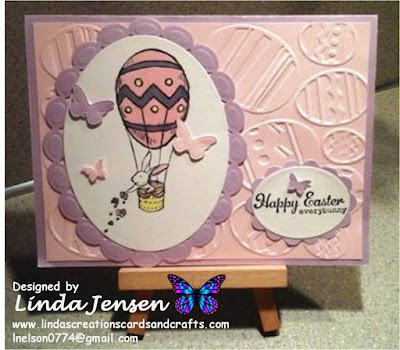 Next cut out the butterflies with a Stampin' Up! Beautiful Wings Embosslit, attach them with mini pop dots and enjoy!